You are driving and about to hit something about to be hit. I know about this one as I have hit a few Kangaroo’s in my time. Jeff Payne a former professional race car driver and the CEO of the non-profit firm “Drivers edge” in Las Vegas. 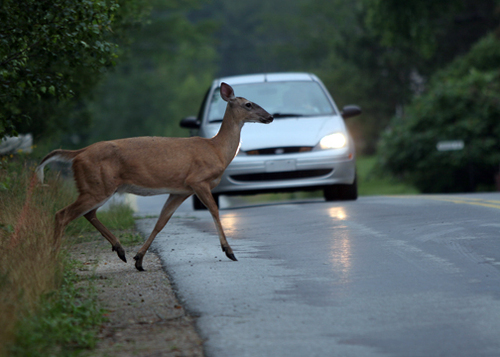 The three biggest objects you are likely to hit on the road is another vehicle, debris, and wildlife. Here is advised to either avoid the accident or minimize your damage. a. ESP – Use it. Be ready for the unexpected especially when you sense the traffic is erratic. If the car in front slams on his brakes look to see if the right lane is clear and move over. At least maneuver your vehicle to minimize the impact. Your brain should be predicting what the surrounding drivers will do. Especially if everyone is driving like mad men. If you are totally focused you will never be distracted. The same goes for motorcycles. b. Embrace smooth and cool – The first instinct when something appears in front of us is to hit the brakes and swerve – No No No – not a good idea. sudden moves could cause you to overcorrect lose control and make the situation worse. c Minimize the impact. – If you cannot avoid impact, alter it. If you are the only one in the car try to angle it so the front passenger side takes the hit. If you have someone else in the car angle it so you take the hit on your side. d. Focus on the main event. – If you come upon an object in your lane do not fixate on it. Your eyes act as your guide, if something falls off the back of a truck and you stare at it, you will for sure hit it. Look for an escape route and that is where the car will go. e. Hit the gas – The only time you will want to accelerate is when you are about to hit a large animal. If you slam your brakes on before, say hitting a deer the front end of your car will dip and this makes it more likely that the animal will fly up over your hood and come through the windshield. Speeding up before you hit will make the front end rise and confine it to the bumper. Aim for the rear end. If an animal bolts it does not bolt backwards. You may miss it or at the most graze it. In that case not too much damage will be done.